...One Saylor's Log: Presidents' Day? Listen to the roar of the falls in the following video clip! Confession: Although the USA celebrated Presidents' Day on February 17th, I gave very little homage to my nation's presidents because I was so focused on celebrating my birthday. From beginning to end, I had a wonderful day! I enjoyed my youngest granddaughter Rose, a bouquet of gorgeous red carnations, and my youngest daughter drove me to Multnomah Falls, and took some photos to show you I really was there :) Then when we got home we had a yummy dinner of stuffed mushrooms, broccoli beef, and stir-fried rice with a yellow cake decked in lemon curd, and nine candles placed by my oldest granddaughter. How did you celebrate your last national holiday? Hello Gracie such beautiful photos. The scenery where you live is stunning. I enjoyed actually listening to the falls as well. As I commented on Teresa's blog would still dearly love to visit - I'm just not sure my health is up to the trip at the moment. The children are so lovely and Rose is growing so quickly ad her bib is just gorgeous. I didn't realise you had a birthday around now belated birthday greetings. Your cake looked very yummy. Belated happy birthday, Gracie!! :) I loved seeing your photos. You had a wonderful day with your family and for yourself too. Happy Birthday to you again Gracie! I truly hope you had a wonderful day! Did anyone ever tell you....you look like little red riding hood in your lovely red coat....looking sporty there lady! Happy birthday to you! I'm so very glad you had a good day. You are in good company too; my son, Tristan, celebrated his tenth birthday on February 15th and his dear guitar teacher on the 17th! I really enjoyed gazing at your pictures. It's been a long time since I set foot in The States and Canada but when I look at your photographs I really get the sense I am there. I particularly like the no parking picture! Excellent. Thank you so very much for dropping by my blog. It is always a treat to read your thoughtful comments. Belated Birthday wishes Gracie :) I laughed out loud at the photo of the snow and parking sign, and the photo of the moss covered bridge has given me an idea for a new project! The last day that I celebrated was last Saturday, it was the commemoration of a battle fought in my town in 1646, and I got dressed up in my costume and marched through the town with a flaming torch accompanied by drummers and other members of the 'army' - it was great fun. Oh Gracie....Happiest of Happy Birthdays to you, my friend!!! How I wish we could share a bit of lunch together, and celebrate you. Celebrate life. Looks like you got to spend it beautifully!! Loved the photos! My niece just moved to Portland. She was in Battlefield Washington, and now is nearer to you. So who knows.....I may get to meet you lovely Oregon ladies one day after all!!! Happy birthday, Gracie! It sounds like you had a lovely time. I'm so glad you got to do things you love with the people you love most. I hope this is a wonderful year for you. Happy Birthday to you! It looks like you live in a very beautiful part of the country! Thanks for sharing your lovely pictures! Happy Birthday again Gracie! It looks like it was a wonderful day, from the picture of precious Rose decked out in her new bib to the cake and candles. You got some beautiful pictures and looky, Spokane is on the sign. Only 305 miles to my house. Well, not quite, but close. I have a picture of that same sign because lots of guys in our family retired from, or still work at the Union Pacific Railroad. I'm so glad you had a great birthday. You deserve many blessings in life. Wishing you a very Happy Birthday, Gracie and a wonderful year ahead! Your celebrations sound lovely, a great day out to a beautiful place (and your red coat looks so cosy and cheerful), family, food and a yummy cake! How sweet baby Rose looks too in her special bib! *H*A*P*P*Y* * *B*I*R*T*H*D*A*Y*!*!*! * to my super duper wonderful blog friend! I'm glad you go to go see how full the falls are. I'm heading off to volunteer there this afternoon. I will see you at the pool tomorrow! Sounds like you had such a lovely day. Happy Birthday!!! Looks like you had a great day and thanks for sharing the photos. It's so very pretty there! The bib looks so cute on your darling little Rose. Happy Birthday! Wishing you many, many blessings. You bless us all so much through your blog. 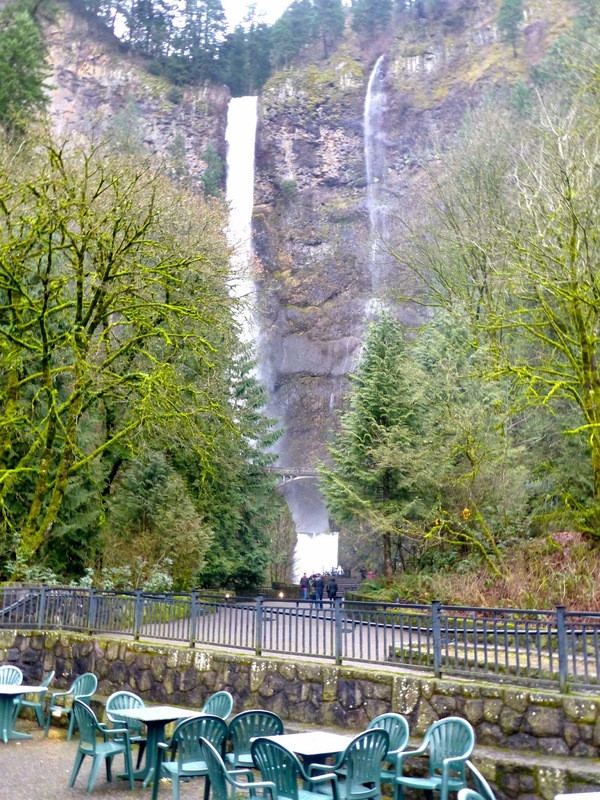 I LOVE the photos of Multnomah Falls and Crown Point. So many good memories of family trips and hikes. Our last national holiday was St. Andrew's Day, November 30th, which was the day we celebrated our American Thanksgiving. Does that make any sense? I am SO happy to see that your birthday was a wonderful one! I LOVE the photo of the moss on the historic stonework--we truly are blessed to have such wonderful scenic areas so very close, aren't we? Great photos Gracie--Happy (slightly belated) Birthday to you! Happy Birthday! I'm glad you had a great day. Your little granddaughter looks super-cute in her lovely bib. Happy Birthday Gracie!!!!!!! If I had known I would have celebrated here in honor of you! I am so glad you had a wonderful day and you were appropriately spoiled. I am so glad you are a part of my life, you are a blessing. Hugs to you Birthday Girl! Happy Birthday, Gracie. What a great day! Love all the pics and to get to spend it with grandchildren. Wonderful! Happy birthday Gracie. I am delighted to see the pics of Fluffy Baa Baa's offspring and their new loving owners. I thought the blurry shots were the funniest as you can just imagine the excitement bursting out. I've just left a comment on Teresa's blog re: how like Scotland the Multnomah Falls look and your pics are very much the same. I love the little video as those falls are clearly some height and that water is deafening. Ps Your cake looks so tasty.